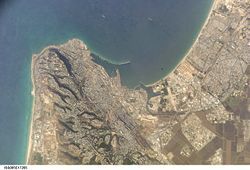 Mount Carmel is a coastal mountain range of modest height in northern Israel overlooking the Mediterranean Sea. Its name is derived from the Hebrew "Karem El" which means "vineyards of God." In ancient times it was covered by vineyards and rich grazing land. In the Bible, a specific but unidentified "Mount Carmel" in this range is famous as the location of the dramatic battle between the Israelite prophet Elijah and 450 prophets of Baal. Elijah's successor, Elisha later lived there, and some traditions speak of a community of Jewish holy men dwelling on Carmel well into Christian times. The mountain later became a place of Christian pilgrimage and was the site of the formation of the Carmelite Catholic Order. The mountains of Carmel today house both the University of Haifa and the Bahá'í Shrine of the Bab, as well as several towns and villages. Excavations in the caves of Carmel uncovered evidence of human habitation there dating back to 600,000 B.C.E. Mount Carmel is 16 miles long by 4-5 miles wide and 1,800 feet high. The city of Haifa is situated at the western promontory of Mount Carmel and partly at its base. The sloped side of the mountain is covered with luxurious vegetation, including oaks, pines, olives, and laurels. Several smaller towns are located on the range, including Yokneam on the eastern ridge, Zikhron Ya'aqov on the southern slope, the Druze town of Carmel City on the more central part of the ridge, and the towns of Nesher and Tirat Hakarmel. Since 1966, Carmel has been the location of the University of Haifa, one of Israel's leading universities. It is also the location of the Shrine of the Báb, and worldwide place of pilgrimage for the Bahá'í faith. 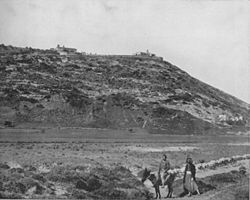 In ancient Canaanite culture, high places were frequently considered to be sacred, and Mount Carmel was no exception. Human habitation there dates back to Neanderthal times, and its recorded fame as a sacred site may have reached as far away as Egypt and as far back to the fifteenth century B.C.E. In the Bible, Carmel is first mentioned as the location of Jokneam, a town conquered by Joshua (Josh. 12:22). It is also mentioned as the western boundary of the tribe of Asher (Josh. 19:24). King Saul reportedly established a victory monument there after his triumph over the Amalekites (1 Samuel 15:12). Carmel's pasturelands were once the home of David's wise wife, Abigail and her first husband, the wealthy but foolish Nabal (1 Samuel 25). 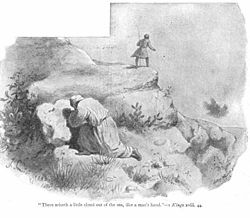 Elijah prays for rain after the battle at Mount Carmel, as his servant spots a tiny rain cloud in the distance. A high place was maintained at Mount Carmel devoted to Yahweh during the Israelite monarchy, but it had fallen into disuse by the time of King Ahab, when it was devoted to Baal, probably the Baal-Melqart honored by nearby Phoenician rulers such as the father of Ahab's queen, Jezebel. Carmel's greatest claim to fame was the battle that took place there between the prophet Elijah and the 450 prophets of Baal, together with 400 prophets of Ashera, to decide which deity was more powerful. Underlying the contest was the question of why neither Baal nor Yahweh, both supposedly capable of producing rain, had not done so during a long period of intense drought (1 Kings 18). Here, the mountain, located in a kind of coastal no-man's-land between Israel and Phoenicia, represented a strategic high ground where the Phoenician Baal and the Israelite Yahweh contended for superiority. After repairing the old altar of Yahweh, Elijah put the prophets of Baal to shame when he was able to produce fire from heaven to consume his sacrifice to Yahweh, while the prophets of Baal failed to produce fire from Baal to consume their offering. Having proved his point spiritually, Elijah proceeded to a physical conquest as he ordered the assembled crowd of onlookers to slaughter the prophets of Baal in the valley below. He then prayed to the Lord to end the drought and a rain cloud appeared in response to his plea. Elijah's protege, the prophet Elisha, maintained a dwelling place at Carmel during his own ministry (2 Kings 4:25). The prophet Amos spoke of Carmel as a place of refuge which would, however, not suffice on the day of God's reckoning (Amos 9:3}. It is referred to by the prophets Jeremiah (46:18) and Isaiah (35:2) as a symbol of majesty, and the male character in the Song of Solomon tells his beloved "Your head crowns you like Mount Carmel." (Song of Solomon 7:5) Jeremiah also predicted that Israel will one day return from exile, and that Carmel would again be known as a rich pastureland from the nation's flocks (50:19). The Greek philosopher Pythagoras was reportedly attracted to Carmel by its sacred reputation. The future Emperor Vespasian went there during the Jewish Revolt of 66-70 C.E. to consult an oracle (Tacitus, "Hist." 2:78). By this time, Tacitus reports, Carmel was the name "both of the mountain and the Deity. They have no image of the god nor any temple; the tradition of antiquity recognizes only an altar and its sacred association." Iamblichus, a Syrian philosopher of the fourth century C.E., wrote that Mount Carmel was "the most holy of all mountains and forbidden of access to many." Carmel became a place of Christian pilgrimage in the later Roman Empire. After the Muslim conquest, Carmel housed several mosques. 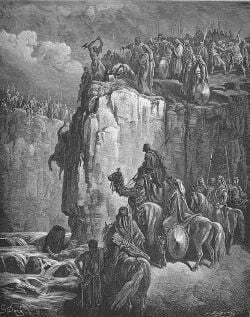 Crusaders on a pilgrimage to Mount Carmel in 1150 C.E. reportedly encountered a small Byzantine monastery there. Its priests claimed that when their predecessors first arrived they had found a community of Jewish Christians who traced their roots back to pre-Christian times, dating back to the "son of the prophets" referred to in the stories of Elijah and Elisha. The Carmelite religious order was founded on Mount Carmel in the twelfth century. The order grew to be one of the major Catholic religious orders worldwide. Prefixed to the 1281 Carmelite Constitution was this statement: "From the times when the prophet Elias and Eliseus dwelt devoutly on Mount Carmel, holy fathers both of the Old and New Testament… lived praiseworthy lives in holy penitence by the fountain of Elias in a holy succession uninterruptedly maintained." Although no documentary evidence of such an ancient community exists, the prophet Elisha is said to have made a pilgrimage to Carmel after visiting communities of prophets further south and later himself dwelt there, so the suggestion is not implausible. After the sixteenth century Carmelite mystics, St. Teresa of Avila and St. John of the Cross reformed the Carmelite Order, the Discalced Carmelites emerged from their tradition and reoccupied the site. A new monastery was finished in 1853. During World War I, Mount Carmel played a significant strategic role. The modern Battle of Megiddo took place at the head of a pass through the Carmel Ridge, which overlooks the Valley of Jezreel from the south. General Edmund Allenby led the British in the battle, which was the turning point in the war against the Ottoman Empire. 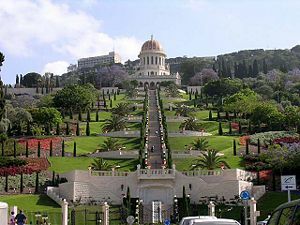 The Shrine of the Báb, completed in the 1950s, is a Baha'i holy place located on the side of Mount Carmel in the middle of the Bahá'í-owned terraces. The remains of the Bahá'í Messiah, the Báb, was first laid to rest within the primitive shrine there in 1909. Also located on Mount Carmel are a set of Bahá'í administrative buildings referred to as the Arc. The location was designated by the Faith's founder in the Tablet of Carmel. The mountain remains a sacred place for Bahá'ís around the world. Modern Essene groups point out that Mount Carmel was the spiritual stronghold of the northern Essene movement described by the Church Father Epiphanius in his Panarion (1:18) and briefly noted by the historian Josephus in his War of the Jews. Excavations on Mount Carmel in 1958 uncovered what some believe to be Elijah's altar, the cave where he lived, the "fountain of Elijah," and the remains of an ancient monastery. However these claims are widely disputed. ↑ Timeline www.athenapub.com. Retrieved August 21, 2007. ↑ Dorothy Garrod as the first woman Professor at Cambridge. www.arch.cam.ac.uk. Retrieved August 21, 2007. This page was last modified on 25 October 2018, at 15:31.